Georges Feydeau was a master in his theatre pieces to make actors enter and exit doors, as in a ballet, causing great laughter in the audience. Also Bernanke and Draghi are busy with exits, albeit in opposite directions and causing much less laughter. Bernanke started communicating to the market that it should not expect the FED to always ease further and that before too long it should slow down and eventually exit from adding to its portfolio of securities. Draghi communicated that the exit from the European Central Bank low interest policy is far into the future and any prospective move would rather be down than up. The first reason why Bernanke is approaching the exit while Draghi has gone out of his way to communicate the opposite is obvious: the US economy is recovering quite nicely, with a growth expected at 1.9 per cent for this year and 2.7 per cent for 2014, according to Consensus Forecasts; the €-area, instead, hovers around zero, at -0.6 per cent this year and at +0.8 per cent the next. The European Central Bank has the additional burden of the North-South macro-economic divide in the €-area, whereby, for instance, Italy will go further down this year (-1.7 per cent) and hardly recover the next (+0.4 per cent) while Germany is doing somewhat better (+0.5 and +1.6 respectively). There is, however, also another, less visible reason for the different directions in which Bernanke and Draghi are moving and this has to do with the balance sheet of the two central banks. This reason has two components: a quantitative and a qualitative one. The quantitative component is illustrated by Chart 1. There one sees that the balance sheet of the Eurosystem (comprising the 17 National Central Banks of the €-area and the European Central Bank) has grown “only” by a factor of 2.5 while that of the FED has grown by a factor of 4, but one also sees that the balance sheet of the Eurosystem has come down quite significantly since the beginning of the year while that of the FED has even increased its upward slope. It is thus not surprising that Bernanke has warned that the precipitous increase will have to slow down and eventually stop while Draghi sent the message that the exit is far into the future. 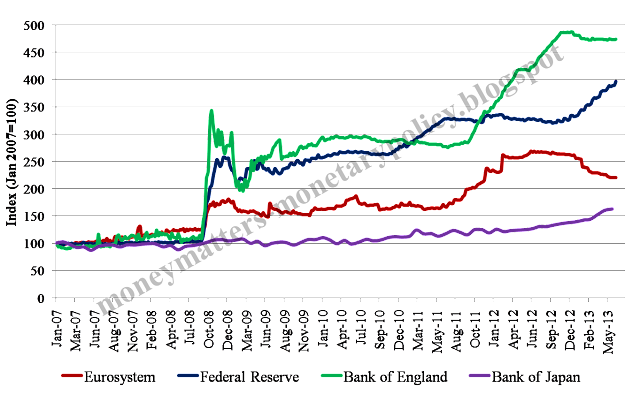 Incidentally, one can also see in the chart the beginning of the new policy of the Bank of Japan, expanding its balance sheet, as well as the fact that the Bank of England, which in relative terms has expanded its balance sheet more than any other central bank of those considered in the chart, has stopped raising it over the last few months. The qualitative component can be seen in Chart 2. Chart 2. Composition of the asset side of the Eurosystem (lhs) and FED (rhs)balance sheet. 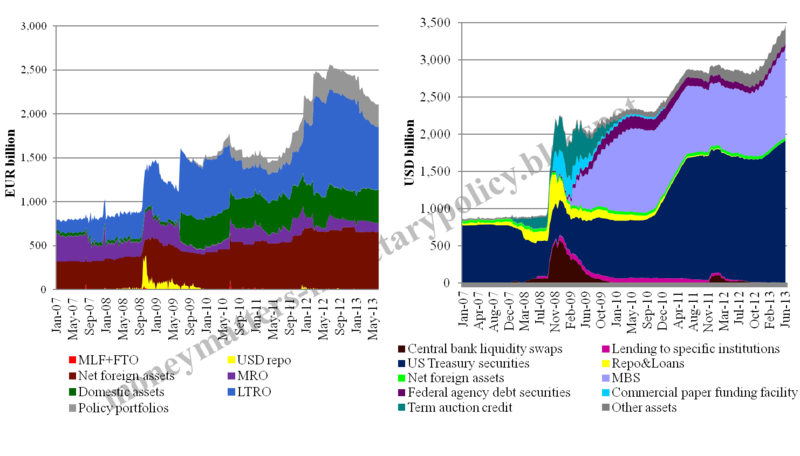 The growth of the balance sheet of the Eurosystem is dominated by the blue area, denoting the Longer Term Refinancing Operations (LTROs), especially the very long ones (first of one and then of three years maturity). So liquidity is given by the Eurosystem on a temporary basis and it is up to the decision of the aggregate banking system how much liquidity to draw at any moment in time from the Eurosystem. 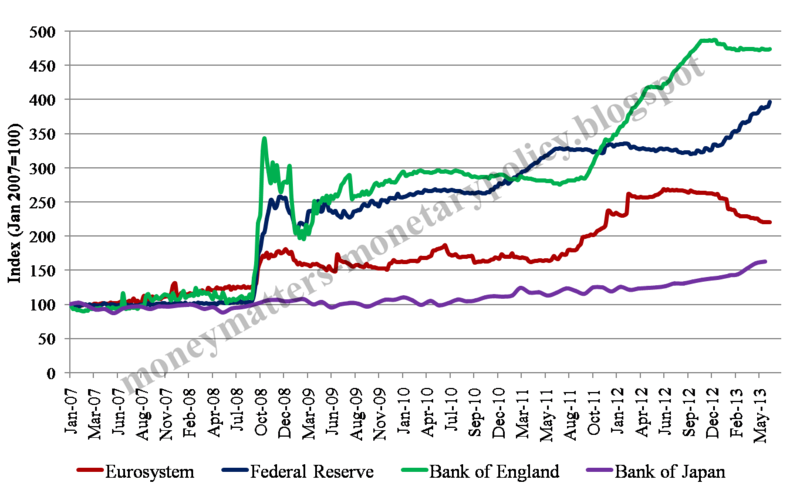 Indeed the reduction in the size of the Eurosystem balance sheet since the beginning of the year is due to banks returning part of the money they had borrowed under the LTROs. As explained in a Bruegel blog (Can the ECB control interest rates?) I wrote with a colleague, this means that an endogenous tightening is taking place in the €-area, which Draghi contrasted first by reducing rates at the beginning of May and then providing forward guidance in June (see Blog-post: Draghi is dancing on the brink of a further rate cut). The growth of the balance sheet of the FED is, instead, at least since 2010, dominated by outright purchases of Treasury and Mortgage Based Securities (the dark and light blue areas). This means that it is the central bank, and not the banking system like in the €-area, which determines the amount of liquidity injected into the market. It is difficult to assess clearly whether the Eurosystem or the FED situation is preferable. On one hand, any move, indeed any announcement of a possible move, by the FED can cause commotion in the market, as shown by the sharp increase of Treasury yields after Bernanke´s announcement. On the other hand, the FED does not run the risk that the banking system would reduce its drawing of liquidity, as it is doing in the €-area, in a way that the central bank judges to be premature and excessive, thus bringing about an endogenous and undesired tightening of monetary policy. At the end, the assessment depends on whether it is the central bank or the banking system in aggregate that has the richer information set to establish the optimal amount of liquidity: If the central bank has superior information, then the FED situation is preferable; if, on the contrary, it is the banking system which has better information, then the task of determining the amount of liquidity should be left to it, as in the case of the European Central Bank. My own sense is that in the most acute phase of the crisis the bottom up information available to the banking system was superior to that available to the central bank and thus it was good to leave to it to determine the amount of liquidity. Currently, I think it is better for the central bank to regain control of liquidity. Since an exit in the €-area from the fixed rate full allotment tender procedure, whereby it is banks that determine the outstanding amount of liquidity, is not advisable, establishing incentives for banks to maintain a high demand of liquidity from the Eurosystem is the right approach. And this is my understanding of what the European Central Bank is doing by reducing rates and hinting at future further cuts.